While wandering around Pierrefitte yesterday afternoon, we came across this curious juxtaposition of signage and not only because it is possibly the last working public telephone on earth. If it’s not the last, then it’s certainly the only one that doesn’t have its walls plastered with the business cards of ladies offering all sorts of healthy alternatives to loneliness. France has a long-evolved socialist ethos the motto of which has been indelibly etched if not on the minds of the people (although how could it not), on every public building, postage stamp, and until the Euro came along, banknote. 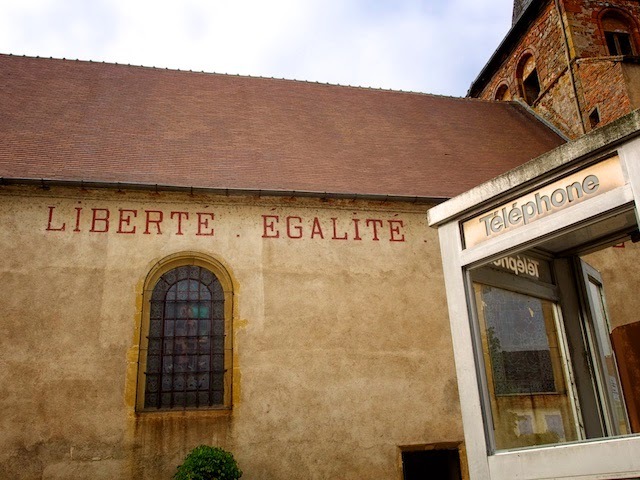 The word “Fraternité” or “brotherhood” is obscured in the photo, but perhaps, (he says as he posts his thoughts to social media), in this day and age “telephone” or telecommunications is the means by which our present day “brotherhoods” are linked. We consider ourselves fortunate indeed to live in this era of telecommunication, where we can be on the other side of the world to those we hold most dear, yet be only a telephone call, an email or a lazy “hit the ‘like’ button” away. On another note, our mooring today, after battling the elements for an onerous three hours including lunch is in a beaut little basin surrounded by camping cars, or as we would have them: motorhomes. Unlike many of their ilk that we have encountered, this brotherhood didn’t spend its day inside watching television. Instead, they sat under cloudless sky, grey hair and dentures sparkling in the sunshine near the waters edge, chatting and laughing and having such a good time all afternoon that it was impossible to have a civilised nap aboard the good ship Joyeux. For just a fleeting minute one gave thought to offering them access to one’s WIFI so they’d all go quietly indoors and “like” each other on to Facebook.